Community theater has been a great occupier of my time, but it has been a nice change from my regular life. This week we are in tech rehearsals and the play will open Friday...with a BANG! The group of people I am spending my evenings with on stage are wonderful and I am so very grateful for this opportunity. Naturally, my home and farm life has not stopped for even a second, and since I am not able to juggle everything....no person could....I have decided to let a few things "go" for now. This is my way of saying the kids are fed and the clothes are washed, but the house is a disorganized mess. I hope to catch up after Thanksgiving. We have kept up with school fairly well, and yet there is always a nagging shadow that hangs over my head. Perhaps we need to do extra math lessons or read more history. Then I remember why we home school. That nagging cloud of doubt really need not disrupt the natural rhythm of home educations. Indiana decided to sew a costume for Halloween, so I snapped a picture of her cutting her fabric. This is truly a skill that I love and it warms my heart that she can sew and that she has the flexibility in her day to spend time crafting a costume. Quinn did have class at the college, but she came home and spent a good amount of time looking at different pottery projects, deciding what she wanted to create in her next pottery class. I almost fretted over the fact that Rose was not doing "serious language school work", until I reminded myself that an hour playing with letter tiles was serious language work. Hands on learning is usually better than a workbook, in my opinion. The swimming pool was ready for a winter cover, so it was "all hands on deck" to help Devin get the pool cover on and fastened. Chores are an important lesson in life. Zeb, my insect loving child, caught several bugs and examined closely their wings and legs. Living in South means there is never a shortage of bugs in the yard to catch. 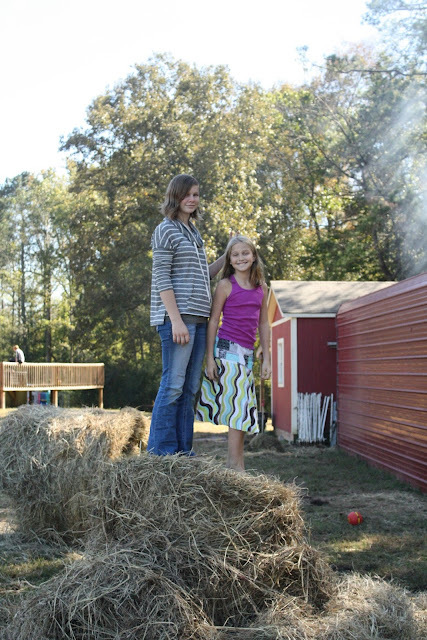 Playing on hay bales is near the top of the list "Fun Things To Do on a Farm." Willow and Rose spent a good while jumping from bale to bale. Finally, a good game of kick ball with an oversized yoga ball is never without a great deal of entertainment. Or maybe they were playing "keep away." There have been many days where my schedule did not go as planned and even more when things on my list didn't get finished...or even started. The kids are growing and learning, and I think I am doing the same. If you are in my area, you can come see the play at the Dalton Little Theater. If you are not in my area.....thanks for sticking around while I took a short break.